I have been trying without success to identify this little flower that grew from my packet of ‘Old Fashioned Flower Garden Mix’ seeds. I wondered if it was a type of scabious, but really have no idea and it’s annoying me not knowing! It must be an annual and it started flowering at the end of June. Previous post: Help! Weed or Plant?! Think you on right lines with scabious,Gillian try google scabious devils bit what you think? 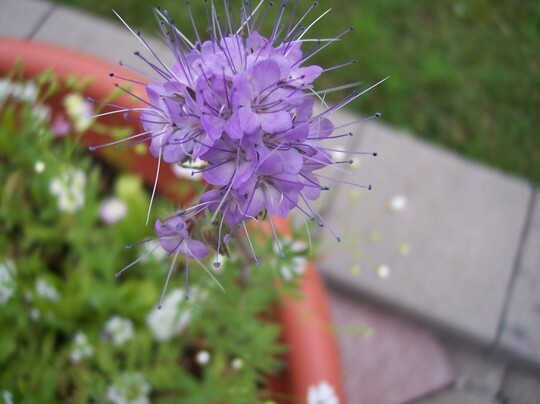 It's a Sheep's-bit (the Latin name is jasione). Checking out images online I think Devil's Bit Scabious could be it. I actually emailed McKenzie seeds as well to ask them what it might be, since it was their seed packet! We'll wait and see what they come up with! Most of the images I found didn't show the leaves unfortunately, that's what I was looking for too. In the second picture above you can see they look very fern-like. I checked out pictures of scabiosa columbaria and the ones I found showed it more like the regular scabious with the daisy type petals around the centre. It's entirely possille of course that it is a variation of that. Just heard back from McKenzie seeds that they will be sending me a list of their seed packet contents! 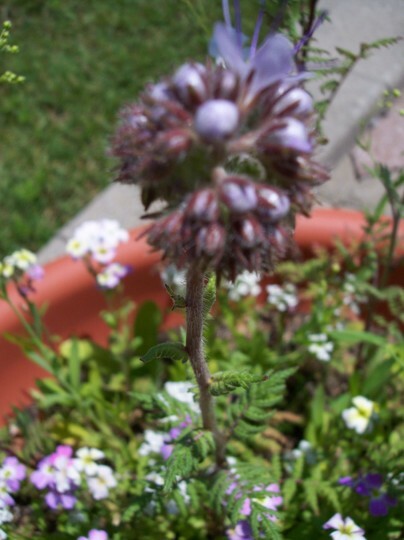 I can now say with confidence that this is Phacelia tansy (Phacelia tanacetifolia) - thank you McKenzie seeds! I have the entire list now of my packet contents. Gillian, I saw you have a list of flowers which would be in the packet. You can type in each one of those you don't know in google images and see what comes up with it. If I had more time I'd do it for you. That's just what I did, Marguerite, for the ones I was not familiar with, and so now I know what I might expect. I'm having fun with the mixed seeds, might try a different mix next year and see what I get! I believe they do a butterfly mix which could be fun. Delayed in visiting, but my first guess would have been phacelia as well. If the leaves are somewhat coarse and hairy and bees enjoy it, then it is a good possibility. Can be invasive esp. in dry wretched soils. It is a survivor. There are some American S.W. natives that are quite beautiful.